I love pay day! I pay all of my bills and then get to see what I have left over. I still want that yellow blazer from Matalan that I mentioned in an earlier post. I also have a hen do to go to in a couple of weeks. It’s fancy dress which I absolutely hate but my husband actually came up with a good idea. I’m going to get some fairy wings and a wand and add that to a dress that I already had. I wear it with a wider belt because the belt it comes with is extra unflattering. It just cuts into the flabby bits which I do not love! My wide belt that I bought last year is perfect for this dress. I might see if I can grab some black sparkly flats from Primark because I know that I’ll be dancing around all night. I don’t think I could handle my heels even though they are of the more comfortable sort. I like the idea of some glittery trainers or something like that. I think it’s quite cute. I have 4 weeks until the hen do so I would like to lose a wee bit of weight before then. A stone would make me very happy! So off the back of that, I need to scour the interwebs for yummy and tasty food, and also get on MyFitnessPal to make sure that I take everything into account. In the 4 weeks I have until the hen do, I have one event which is a wine tasting. I may well bring you also to that as it is at a friend’s house. On that night, I will be drinking and probably eating a lot of bad things!! But I think that it is a special event and I don’t do this every weekend. There’s no point in restricting myself because that wouldn’t be a particularly natural way of life if I didn’t treat myself! I’ll start investigating tonight to see what it is I want to get for lunches and dinners. I have the day off on Tuesday so that will be my shopping day. I’ll do my food shopping but also some clothes shopping. I still have a £20 voucher for Primark from Christmas so I think I can manage a mini-haul out of that! Up the Amp by MAC. I love this purple colour to go with the green of the dress. There’s something about it that I think makes it more suitable than red. And it has an edge. The 187 Duo Fibre Brush from MAC. I need some new brushes, since I have gotten into make up a lot more, I have realised how important brushes are. I need to invest. 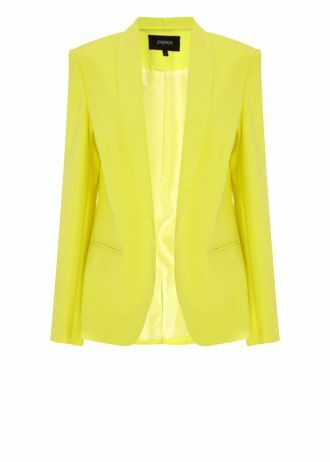 You already know about this Tallulah Blazer from Matalan. Love the brightness. Love that it’s a blazer. Love, love, love it! Okay, these aren’t necessarily the shoes I want but I think this sort of thing will be totally cool with my dress. I’ll also take a look in the Vans store near work to see what they have. If anyone else has any ideas for me, please let me know!! Previous Post Hard as Nails! Next Post I did it! YouTube is officially a go!